History Detectives investigates the mystery behind an unusual Navajo rug. To the Navajo, weaving is more than a simple craft – it is a spiritual practice, connecting the weaver to the spirits of earth and sky. Their symbols tell stories from Navajo beliefs. But tradition also holds that some symbols are too sacred for the loom and to capture them risks harm to the weaver or their family. 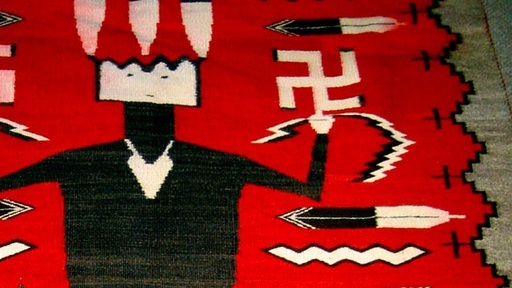 Our contributor from Lompoc, California has a rug with a series of baffling symbols and wants to know what the story is behind this rug and who the weaver could have been. History Detectives meets with a Navajo medicine man and a traditional Navajo weaver and tries to discover if the weaver violated a taboo to create this rug. Also in Season 7 Liberia Letter Does this letter help to trace one freed man’s dream to return to Africa? Also in Emerging Modern America: 1890-1930 Women's Suffrage Painting What role did this watercolor painting play in securing women the right to vote? Related Investigation Carson Family Secrets Is this book a Carson family heirloom? Also in Season 7 Scottsboro Boys Stamp Did a penny stamp help save the Scottsboro Boys from the electric chair? Also in Emerging Modern America: 1890-1930 Amos n' Andy Record Is this aluminum record an early recording of the old-time radio series? Also in Season 7 War Dog letter The military put great effort into a new War Dogs program during WWII. What went wrong on Cat Island?